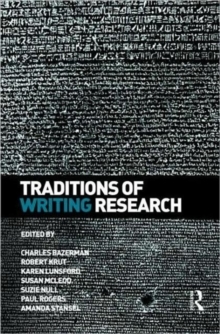 Traditions of Writing Research reflects the different styles of work offered at the Writing Research Across Borders conference. Organized by Charles Bazerman, one of the pre-eminent scholars in writing studies, the conference facilitated an unprecedented gathering of writing researchers. Representing the best of the works presented, this collection focuses solely on writing research, in its lifespan scope bringing together writing researchers interested in early childhood through adult writing practices. It brings together differing research traditions, and offers a broad international scope, with contributor-presenters including top international researchers in the field The volume's opening section presents writing research agendas from different regions and research groups. The next section addresses the national, political, and historical contexts that shape educational institutions and the writing initiatives developed there. The following sections represent a wide range of research approaches for investigating writing processes and practices in primary, secondary, and higher education. The volume ends with theoretical and methodological reflections.